The rains this year have been plenty and generous, and I can’t remember such an extreme wet season in Cangandala since the 2005/2006 season. This fact has several consequences which, one way or the other, affects our work. The first and most obvious result was the rivers flooding, which considerably reduced our mobility inside the park. Actually, and as soon as the rains grew in intensity around mid-January, the park main road was cut-off, and we had to walk across with water above our knees to get in. Approaching the animals in these conditions turned out to be almost impossible, and the only exception was a brief observation and still photographs taken in January. Nevertheless, the abundant rains might be a blessing, especially following several very dry seasons in a row. It reduces the risk of intense drought, it replenishes underground water resources and the soils should keep moisture for longer into the dry season; and the lush development of the vegetation should provide lots of grazing material. On the other hand, the constant rains did not allow for strategically placed small out-of-season burnings, which in previous years had contributed for a balanced veld management and food provision for the animals. Another concern is that the overgrown grass this year will turn into a huge amount of dead grass – combustible material, thus increasing enormously the risks of hot fires inside the sanctuary during the dry season. Basically, the weather conditions this year might prove to be good in many respects, but will demand carefully planned and assertive management in the next few months. As for the animals, as always there are new developments to report, and this time a huge surprise was registered. While observing a herd inside the sanctuary in January, we couldn’t believe our eyes when we spotted Joana among the group! This was a totally unexpected. Joana ‘The-Mad-Cow’ had proved to be anti-social and had escaped under the fence soon after being captured in 2009. She had since remained outside the sanctuary, behaving in a secretive fashion, declining to approach the hybrids when they were around in the first two years. Although we looked for her, we failed to find her during the 2011 capture exercise. Finally, even when having Ivan the Terrible was around, they didn’t seem to ‘connect’, as they were never recorded together in spite clearly overlapping their roaming territories. Of course, neither of them seemed to be friendly characters, but we always had hope that they could get along somehow… or at least meet on a special stormy night. On the other hand, we still fear the day Ivan will break through the fence into the sanctuary, but the last thing we expected was Joan to decide to crawl under the fence after 4 years of deliberate isolation! As the rainy season progressed, the animals split into several smaller sub-herds. At one time, apparently into 4 groups, one group with old females and the old bull Duarte, a second group with young Mercury and many young females, a third group composed of a couple females a younger male and several calves, and the last group mostly comprising hybrids. Other than this we had to rely on the trap cameras to know what was going on, and here our expectations were fully met. Back in December we were convinced that Teresa, one of our two old breeding cows that had conceived calves in January and February (the other being Luisa), would produce a second calf before end of 2013. Well, not only we could confirm that, but also surprisingly, both cows produced the second calf by turn of the year! That was fantastic, as both cows, in spite of their age, seem now to be well synchronized, and producing calves every 9 months. This brought us to a total 2013 production of 7 calves (where 2 old females alone produced 4 of these), of which 3 were females, 2 males, and the two youngest still undetermined (although at least one of the later seems to be a female). Truth be said, the second male calf born, hasn’t been seen in many months and may well have been killed. Some degree of calf mortality is unavoidable, but if confirmed, it was the first casualty in 3 years, and in any case it is better to lose a male calf than a female. The second trimester usually marks the transition from the wet to the dry season. It has hardly been a favorite of mine, as April tends to be too wet and waterlogged, while in May and June the dead grass takes over and the bush fires start, making field work uncomfortable and not very productive. It is never a good time of the year to observe the animals, as our mobility is reduced, and they have plenty of cover. If this wasn’t enough, the abundant rains of the ending rainy season delayed the normal sequence of events at least one month. Even throughout June, we struggled to drive across the floodplain that defines the western boundary of Cangandala National Park. Not surprisingly, we had very few sable observations to report. The most we could do, was to approach the young herd a few times, now proudly supervised permanently by magnificent Mercury (the first born of our "new" Cangandala). Attempts to approach the larger herd, comprising old females and hybrids, were not very successful because of the elusive nature of hybrids, dense cover, and made worse by the conspicuous absence of ol’ Duarte. In spite our efforts, we could not track his radio signal anywhere. Considering the fight reported on the fence at the end of March, we fear that we may not see the old bull again. A pity, as he had made a miraculous recovery after last year’s challenge, however he was getting too old. On the other hand, Ivan, as the trap cameras confirmed, looks as strong as ever and unscratched. What worries us, is that Mercury will be next in the succession line under Ivan’s radar, and sooner or later might be challenged for battle… and we cannot afford to lose young Mercury! The biggest surprise in the sanctuary was finding a pair of reedbuck. 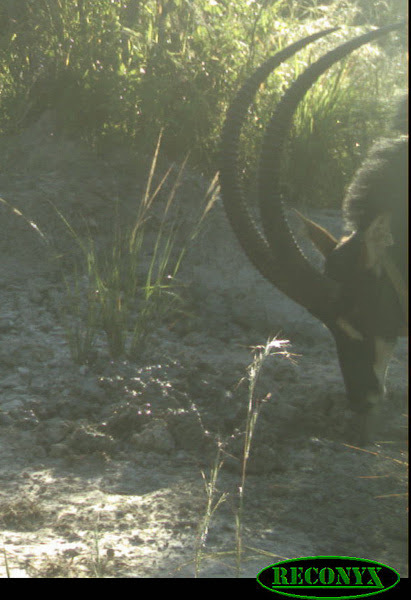 Over the past two decades, reedbuck were almost wiped out in Cangandala (although in Luando they are still common), and the last sighting had been in 2009 in a floodplain further south. We certainly didn’t expect any reedbuck to had been caught inside the fence perimeter, where the habitat is not the most attractive for this species. Reedbuck in the region generally prefers more extensive open areas associated with drainage lines. However a careful look at the photo record, gave us some hints on how they had ended up here. Being an adult female and a very young male, suggests they are mother and son. A likely scenario would be the female moving into the woodland to give birth, precisely when the fence was being expanded and as result she ended up imprisoned inside the sanctuary with her calf. Even if the habitat is not their most preferred, they will be safe inside the camp, and now bear the responsibility to repopulate the area! In the Luando reserve, rains had also been generous, but the most worrying factors are insisting reports of poaching, brought to us by the shepherds. Poaching does seem to be closely linked with several diamond operations established along the Kwanza River, as they create an increasing demand for bush meat, and this remains unchallenged. And of course, well-armed poachers, who are not only a permanent threat to the animals, but also put the lives of our shepherds in danger. Some steps are being taken to tackle this crisis, and I’m hopeful it may produce results soon. Next trimester we expect to make a new aerial survey, and place up to 20 collars on sable in Cangandala and Luando.